Quote Reply Topic: Re-outfitting "Dream Camp Kitchen?" Many of the pots, pans, utensils, and stuff that could easily walk off have. I found a few large aluminum pans hidden and misused around the property but it needs restocked. The water lines were allowed to freeze so new lines need buried (deeper) to the kitchen (and shower house). I'll try to post a few pictures soon. 2 groups are fairly excited about renting the camp and one (SCA) has a trailer full of their own cooking gear. Both groups have lost other sites recently and want to rent as early as this November. What all would you recommend restocking with and where are the best prices? Aluminum pots? Cast Iron? Stainless? Utensils? How big? https://www.agrisupply.com/cast-iron-cooking-supplies-utensils-kitchen-accessories/c/6200000/pgnum/1/ ? I went shopping and to some auctions on my recent visit but found surprisingly little cookware let alone big cookware. 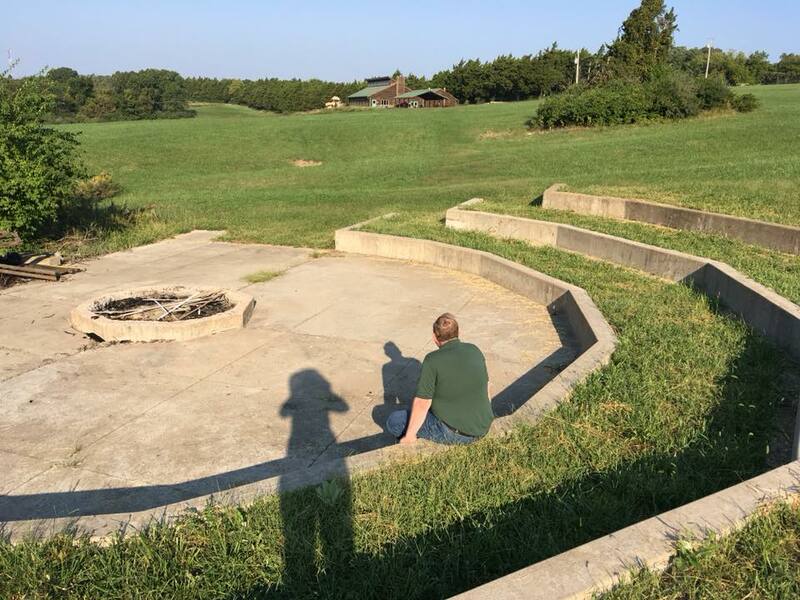 It was really a treat working on the old farm-turned-camp and I am excited about getting it up and running. My sister is living there and doing most of the work. Her rough plan is to turn it into a wedding/event venue since those seem to rent well in that area. These groups wanting to rent it is just a bit of a windfall since they are looking for more rustic sites than most weddings or Church retreats might want. This looks like a great opportunity to put some of your historical skills to work! Brook probably knows much more about this than I do, but if I were in your shoes I'd try to get as many things as I could that would "do for now" and then slowly work in plans to convert to something rustic and historical; Dutch ovens, spiders etc. If there's a blacksmith in the area, you could probably get some really nice pieces made. I might be getting a little carried away with the idea, but it's something to think about. People often want to travel back in time a little when they are camping. While Ron's idea has merit, most of the scout camps or other camps I've ever been to the chow hall is run like a restaurant, so the guest wouldn't see the cookware anyway. Do you have a restaurant supply type company close? If so, I'd go there and see what you can find. Good point - if we're talking large groups, then "living history" might not be very practical. 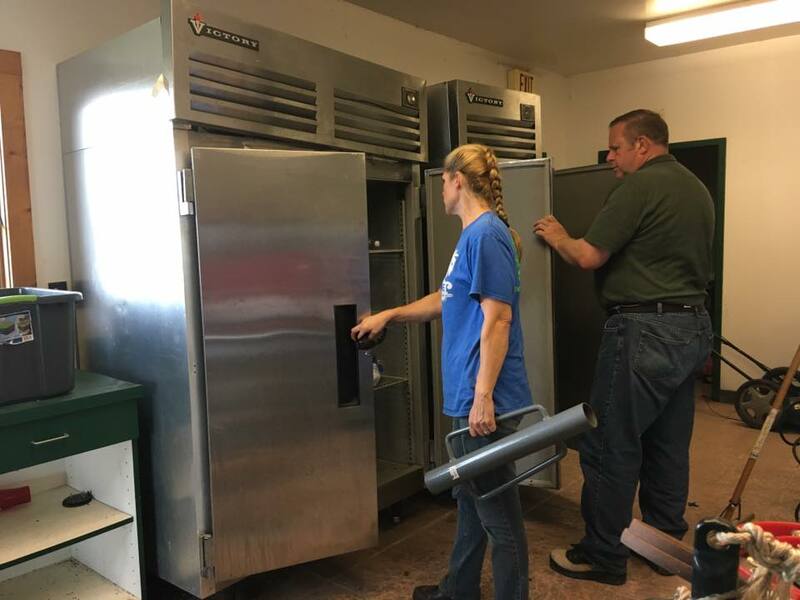 Another option: check with some restaurants in the area; they might sell off equipment as they get new stuff. Not ideal but it could be a huge money saver, if that is a priority. IF I ever get home for a waking minute I'll post some pictures. This is really a visual project. I am on the same sheet of music about more historical cookware like cast iron. Maybe, someday, even a clay oven. 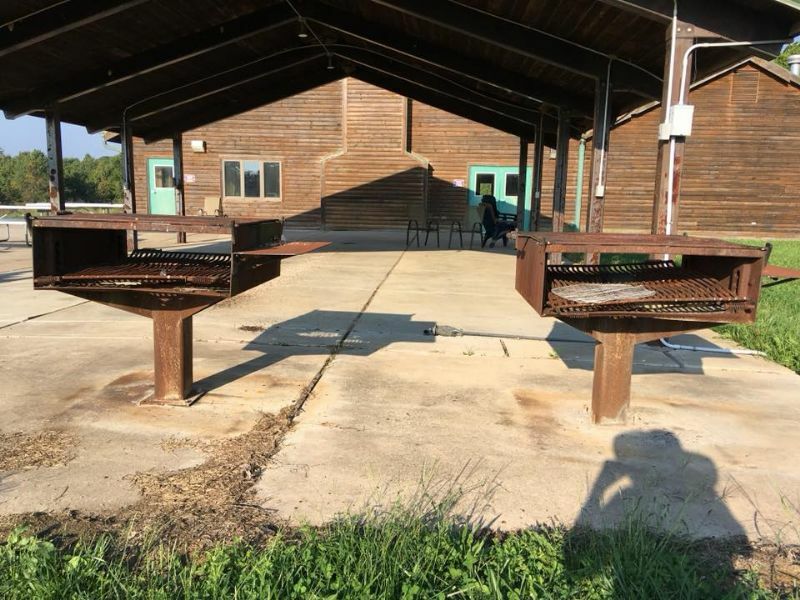 https://www.youtube.com/watch?v=i0foHjPVbP4 There is a large outdoor pavilion right outside and it has two very large charcoal style grills (maybe 6'x6') but the bottoms are rusted through and need thicker replacements. However, any potential wedding or other mundane renters, caterers, and even SCA cooks would probably appreciate regular stainless and aluminum cookware. If there is a good, cheap, restaurant supplier near St. Louis I could not find them. I found some grilling utensils which are "good enough for now." There is a mixer like this but I have never used one..... Can these knead dough? The dishwasher looks pretty much like this one. The stove is similar to this but only has 4 burners and the grill needs some serious scrubbing. What do regular people eat at wedding receptions? What cook books and other reference books should be there? Karl, re: the KitchenAid, it depends on the model. They can all mix dough, but the model type determines how much at one time. Among those three tools, the paddle and hook are what are used for dough making. The paddle is for initial mixing of ingredients, and the dough hook---well, the name says sit all. KA rates them by the number of cups of flour. But those figures are, shall we say, optomistic at best. KA says, for instance, that my Pro 6 model can handle up to 12 cups of flour. Realistically, anything more than 8 puts a decided strain on the motor. For your purposes, I would consider the Pro 7. It ain't cheap. But, if you're making bread for a crowd, you need the capacity. This is mixer already there. I did not think to see how big the bowl is or if the data plate says what size it is. I do not recall a dough hook but I didn't dig that deeply. That Hobart is all you'll need for any mixing chores. It is, in fact, what the Kitchen Aids are based on. 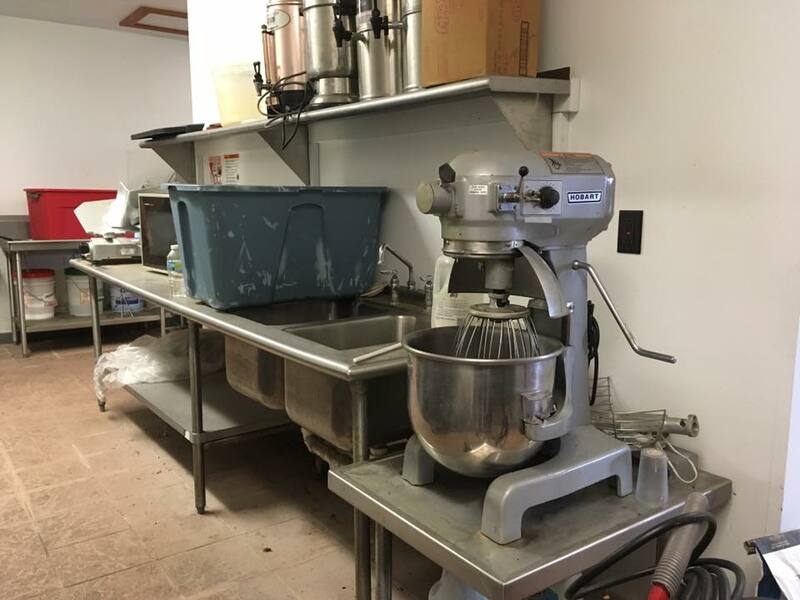 What you have is one of the smaller commercial mixers. I don't know, exactly, what the capacity is. But the motor is strong enough to mix anything you can fit in the bowl. in terms of dough. If it doesn't have a dough hook, I recommend you bite the bullet and can one for it. I can't quite make out what the tool behind the unit is, but I suspect it is, indeed, the hook. A paddle would be a useful tool, but, for the dry ingredients at least, that whisk will serve. I'm concerned about the double sink, though. 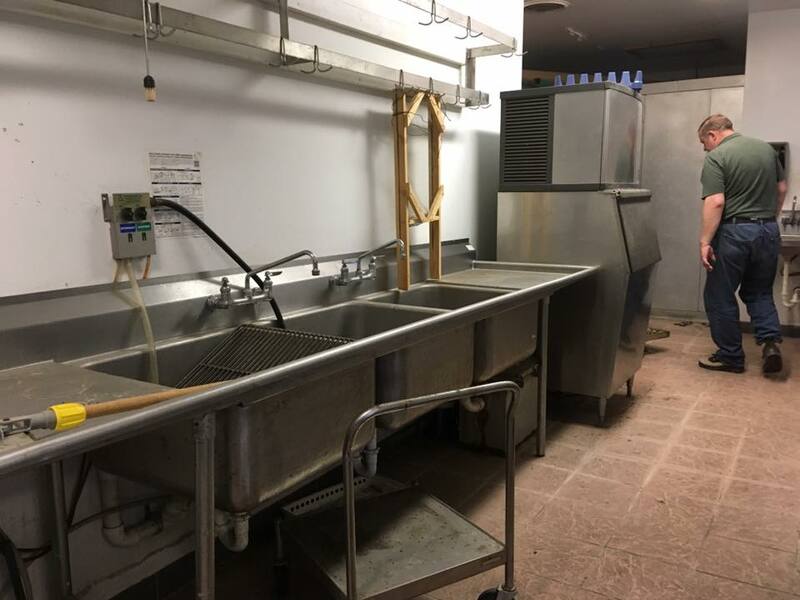 In most locales, health regulations require a triple sink in a commercial kitchen. Check with the local board of health to see what's required. In a normal procedure, all three are used. The first sink holds the cleaning compound plus water. Second is a rinse tub. And the third holds sanitizer. 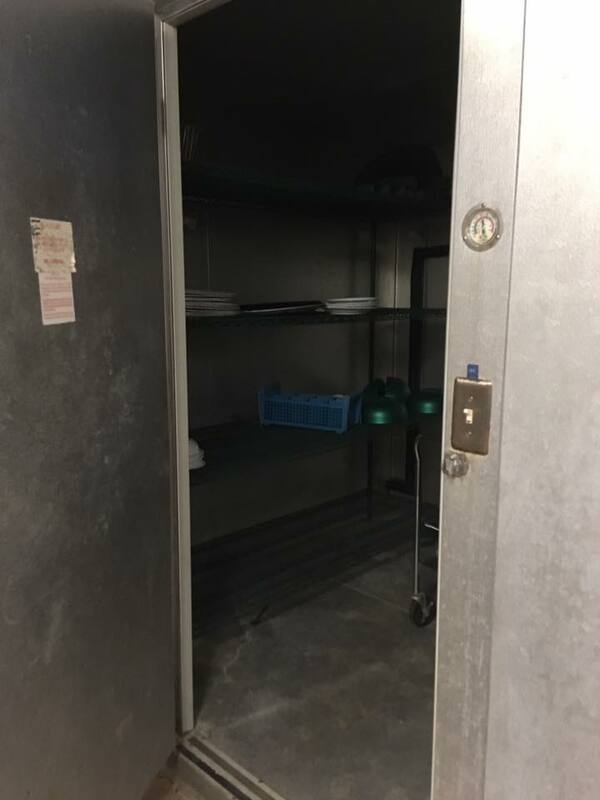 For commercial food handling, cookware has to be air dried, and you might want to look into racks for that purpose. Their are other nuances, and at least one person should have a food-safety certificate. ServeSafe is, in most jurisdictions, the certifying organization, and you might want to check out their website. There is also the fancy dishwasher which may or may not matter. 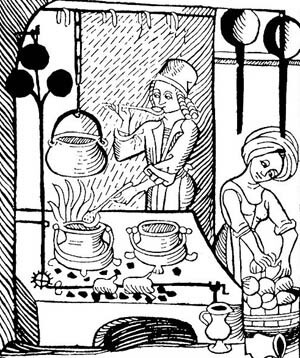 I found the pdf of the MO HSS food handling guide but it may be a while before I muddle through reading it. 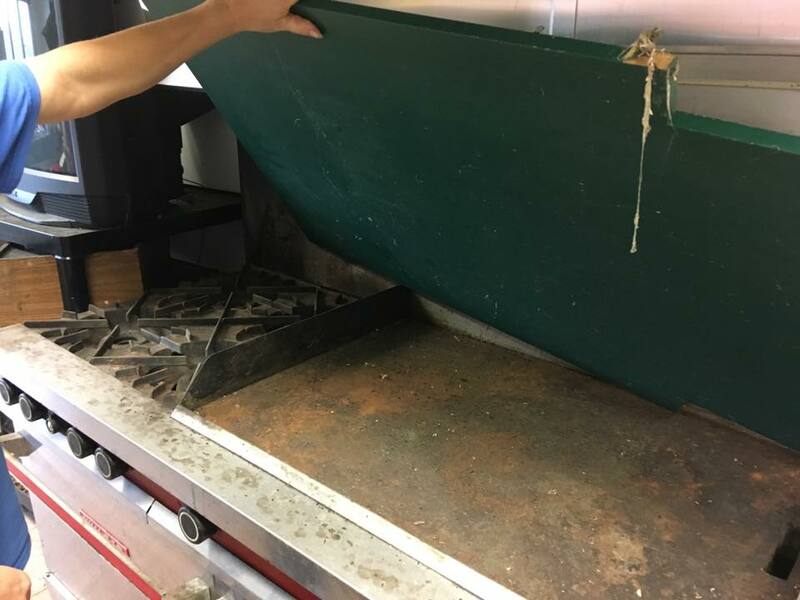 Are there any "magic tricks" or specialized cleaners to reconditioning grills like this? Just a Scotch Brite and elbow grease? Do you know what kind of material the griddle is? If it's steel you could probably hit it with a grinder and then reseason, or something like these grill stones, which are essentially blocks of pumice, and a lot of elbow grease to get it cleaned up. I'd think of anything as aggresive as grinding to be a last resort. Instead, try this: warm the flattop and coat in with a thin layer of oil. Then go to work with grill stones. That should lift the worst of it. Follow up with hot water, detergent, and---you guessed it---grill stones. You might have to do that two or three times. Any restoration work will depend not so much on cleaning tools and ingredients but elbow grease. 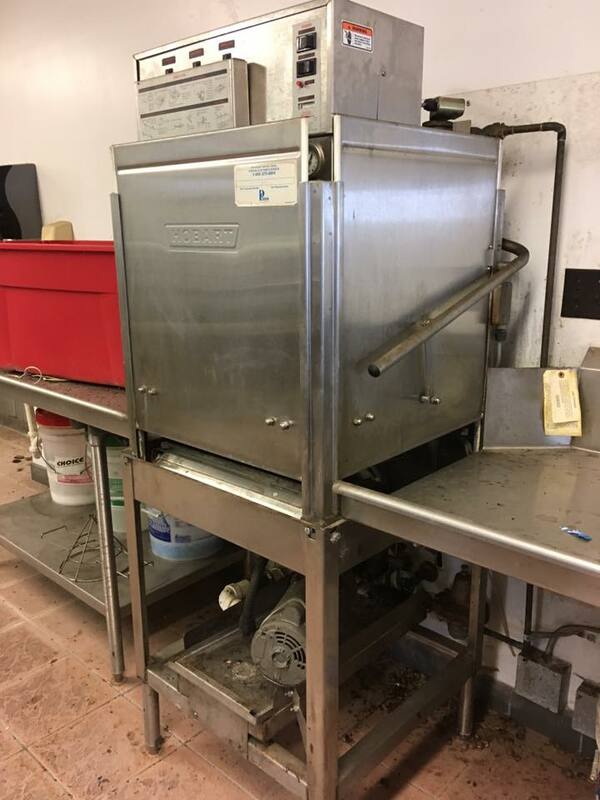 Also, asking anyone with experience working in a commercial kitchen, how do you clean to make sure that you pass any local inspections? I was planning "death by bleach", moving everything to get in every corner, then enough Pinesol to cover the bleach a bit. Are there more tricks of the trade? 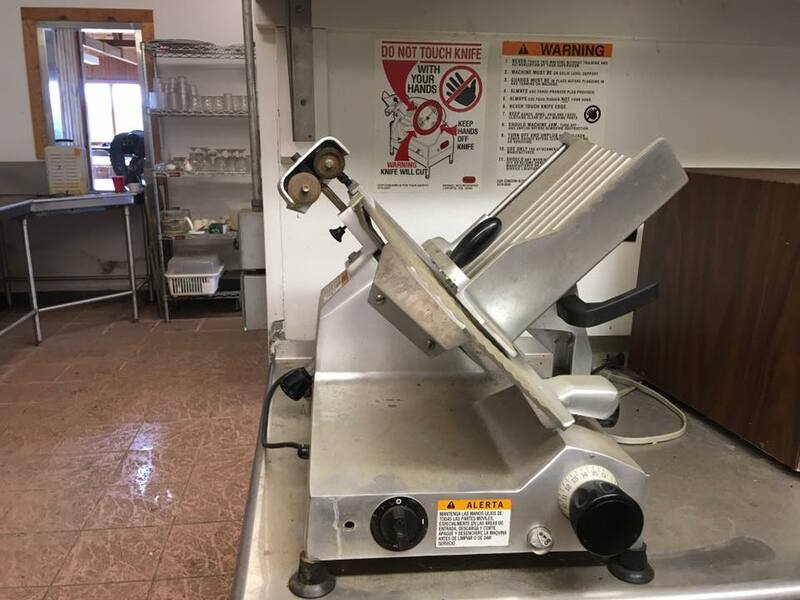 I have been a kitchen slave in a few camp kitchens over the decades and none of them exactly impressed me with their cleanliness or were even as clean as old Army mess halls but we would like to do better. There are companies that specialize in restaurant and hotel sanitation products, Karl. IIRC, the big name in the industry is Eco-Lab. But I'm sure there are others. Hi Karl! I was a member of this forum a few years ago. I came here tonight looking for my favorite pizza recipe because my Foods of the World books are sadly, long gone and I knew it was here. That's a 12 quart Hobart. It'll do a lot of things but it depends on what you want to do. I'd like to know if I can offer you any guidance with your project. Sounds like a lot of fun!